Learn about the guiding principals that drive our team to deliver successful Dynamics 365 and Microsoft Business Application solutions to our customers all across the globe. Never Miss a Video, Subscribe Now! Paul: We truly are a global business. We operate as one team. The most exciting thing about our rapid global growth is getting to work with new colleagues, getting to introduce them to the PowerObjects way of working, getting to understand the strengths that they can bring into PowerObjects and having them deliver that value back to our customers. We’re really fortunate to have customers that recognize the value that PowerObjects can bring them. Marco: We are a breath of fresh air to the European market and we’re bringing new ways of delivering value to the Dynamics 365 customers. And we love getting engaged with user groups, events and different community activities. Paul: We have a core set of values and guiding principles that really resonate across our organization. Always add value, love what you do, live the technology, do the right thing and think team. Jon S.: Adding value means adding value to my teammates, adding value to my day and adding value to my customers. LaToya: I add value to my customers by being a constant person of reference for them. I’m also somebody who the will consider to be a professional in that I’m always willing to help and guide them in any way possible. Paul: What I love most about coming to work at PowerObjects is both my colleagues and my customers. They have such fantastic people, people with real passion, people with energy and we also have fantastic customers that really understand operating in partnership is what this business is all about. Chris: Coming to work I feel that I’m part of something much bigger now. Before I joined PowerObjects I always looked at it as this beacon of best practice and now I’m actually part of that and delivering those best practices to the community. John D.: Customers expect people who use Dynamics every single day to implement their products and we do that. PowerObjects is the one company that is truly and singularly focused on Dynamics 365. Marco: Power Packs are a unique way of delivering value to our customers. Our worldwide delivery teams look for opportunities to package solutions that we can repeat across products and implementations to re-utilize and bring the IP to de-risk and simplify our client’s implementations. Chris: For me doing the right thing is having integrity. One to our customers, our colleagues and also to the community as well. Pavlos: To me doing the right thing is being honest with a customer and sometimes we have to say no. This is how we earn respect. John D.: The one thing I know about PowerObjects is that even though I’ve had lots of experience with the product, they’ll be something that I don’t know, or something that I want to know. There’s always someone I can reach out to. It’s a really good example of how we think team here. There is always someone available and willing to help. LaToya: In the end, everybody is always willing to learn from somebody else. Paul: We have a fantastic global team, a world class technology that we work with, teams based around hubs in North America, Europe and APAC. We have a world class GDC based in India; that’s a top team of certificated Microsoft professionals with world class skills to compliment our local teams as well. We really live out the values we have as an organization and bring those values into everything we do with our customers. June 7, 2016 powerobjectsweb_o6z0dz	Be the first to comment. PowerObjects, an HCL Company, is the winner of the 2016 Microsoft Modern Marketing Partner of the Year Award! June 14, 2016 powerobjectsweb_o6z0dz	Be the first to comment. 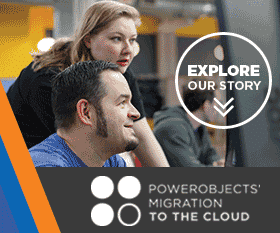 See why choosing PowerObjects as your partner in your Dynamics CRM journey is one of the best decisions you can make! December 25, 2015 powerobjectsweb_o6z0dz	Be the first to comment. Get a closer look as Rick of the Rusty Taco Food Truck tells PowerObjects about their delicious food and PowerObjects’ Food Truck Friday.